Are you looking for something you could carry around without needing a big bag? If you are searching for a slim but roomy wallet with plenty of room for cards, cash, keys and cell phone, then this is the perfect wristlet for you. It's great for travel and can hold your money, cell phone, passport, ID and room key/card for easy access. In the evenings when you are out with friends for a night on the town, it can really put your mind at rest not having to worry about belongings with the wrist strap. It is also great for concert, shopping, dinner outside whenever you want to carry just a few items! Buy it just now! This product will not let you disappointed! 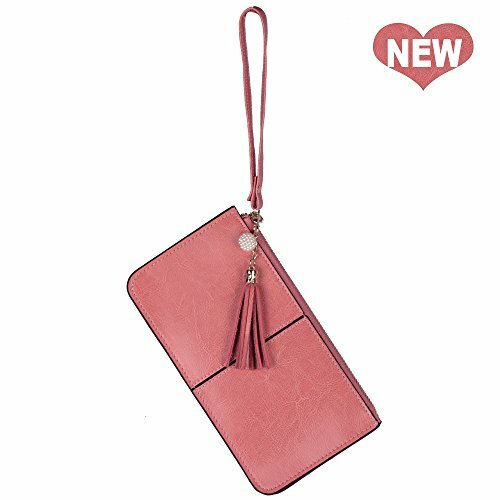 Lovena packs this elegant leather wristlet with a convenient zip lock anti-dust bag, and you can place it back to package after usage. We strongly support every customer, for any quality problem or question of our product, just contact us from Amazon freely, Lovena will NEVER let you down. For defected product, you can fully get your money back, in addition to that, we even can send you a new replacement for free. Please notice that it can be a slight color difference between what you are seeing here on your screen and what you will see in real life. 1. MATERIAL: Rich and soft split leather, Good quality gold-colored hardware accents and soft brown lining. Smooth and quality zipper makes it easy to zip open and close. 2. SMARTPHONES CAN FIT: Fits any phone up to 6.1" X 3" X 0.3" inches (Length x Width x Depth in inches), including: Apple iPhone X/8/7/6s/6 Plus, iPhone 8/7/6s/6 4.7", 5S 5C 5 4S 4, Samsung Note 8, Note 4, Samsung Galaxy S9, S8, S7, S6 S5, LG G2, HTC ONE M9, HTC 626S, MOTRO LG . ATTENTION: it can only fit naked iPhone 6/6s/7/8 plus, Note 9/8 or with a slim case. 3. WALLET: Slim designed but super ROOMY. Three compartments stitched together to form the wallet. You can fit your phone easily in one compartment. (It also has a smaller zippered section on one side for coins and 3 card slots for cards); A zippered middle section for private belongings; A third compartment with card holders in the lining, 3 on each side and a center area to carry such as keys, nail file, lipstick even a small makeup. 4. STRAP: One 6.5" sturdy wrist strap to act as the zipper puller handle and leave hands free while carrying. 5. PRODUCT EXTERIOR MEASURE: 8.1"(W) x 4.3"(H) x 0.8"(D). You can throw the wallet into a larger bag to use as a wallet or bring it solo for outings. You will enjoy the convenience and quite stylish design. If you have any questions about this product by Lovena, contact us by completing and submitting the form below. If you are looking for a specif part number, please include it with your message.